They came out wonderfully Diana. I agree.. wrinkled is a great look for them. Paired with the shades, stunning. You did a FANTASTIC job! They look like ones I have seen in catalogs. I always love your DIY projects around your home! they turned out beautifully Diana....you did a GREAT job! I think Karianne at Thistlewood Farm has some too but hers are "store bought". I won't be making any smocked burlap curtains anytime soon but I'm going to check out that video just in case I want to one of these days. We're having rain and ice here today...but we're going out of town Friday for a few days headed toward the Gulf where temps are supposed to be in the 60's! I'm soooo ready for spring! They look great. We are moving into a small house in a few months and your home is my inspiration. Wow these turned out gorgeous! I've seen a lot of burlap curtains but I haven't ever seen smocked ones! These look perfect in your dining room! Love them!! It is beautiful. I bought one panel from a blogger and I love it. It brings just enough of the sun in. Your curtains look beautiful, Diana! I loved how you learned to make the look you wanted...and you did a wonderful job! They look wonderful. How much fabric did you leave at the top to make a rod pocket? Absolutely fantastic!!!!!! And, thanks for the links. I always look forward to your posts. Stay warm! Those are fabulous curtains! You did a wonderful job!!!!! The burlap and the smocking make a beautiful combination! LOVE, LOVE, LOVE! You are so talented Diana! I really enjoy when you have new posts, it's such treat. You have a lovely home. Whoa...I can't believe you made these! I am so impressed!! They are beautiful! They look so beautiful. You are insanely talented! What a great job! Your curtains are fabulous!! I am in LOVE with these curtains! You did a beautiful job! I'm going to attempt it myself and was curious how big you made your grid to do the smocking? (How far apart were the dots?) Thank you!!! Hi JZ, my dots were 2 inches apart on all sides and I sewed a 2 1/2 inch pocket at the top for the curtain rod. Hope that helps! Good luck! very nace...old ;) I like your blog, I follow you from Spain !!!! You did an awesome job on those! I think you are amazing! I love these. Just wondering, I have a large amount of muslin and I also have some osnaburg I'm thinking I might try this for café curtains in my poor pathetic little kitchen. I'm thinking osnaburg right now, any thoughts anyone? Diana- I love stopping by your blog, you always have something inspirational for me to look at and aspire to do! I love the curtains! Random question, where is that beautiful barn located? It's just gorgeous! Diana - I love stopping by your blog and getting inspiration from your beautiful house and fun projects! Great job with the curtains, they turned out great! Random question, where is that beautiful barn located? I just love it! The smocking is so pretty, Diana. I love how the light shines in your pretty room. Is everything ok? We miss you around here! Hoping all is beautiful in your life.. come back! Love th curtains but I have a question about your chalkboard wall. Did you chalk on it yourself and if so how were you able to get everything lined up correctly? I might have missed an entire post on this, sorry if that's the case. I just painted our pantry door in chalkboard paint and I'm trying to figure out the best way to write on it. Thanks so much. Such a lovely home you have! I've bought painters drop cloths and smocking tape(yay!) to work on this project, now only if I could buy myself some time! Where did you get the rug under the table? What a lovely home! I like the home interior designing and interior furnishing very much! Hi Diana! These are beautiful! Cannot wait to use up some of my burlap laying around. About to sound a bit silly but how did you go about hemming them? I have never made a hemline before and do not have a sewing machine. Diane, they are lovely. One word of caution, though. I loved the idea of burlap curtains and made them for a partial canopy over our bed. We were living in a very arid climate at the time, and within a few months I discovered that the burlap in those gorgeous curtains were a major dust magnate. Whe n we took them down and laundered them to get rid of the dust and dust mites, they lost their crisp fullness, shape and they shrunk. I was unable to put them Back up. Now remember this was desert southwest, so could be only a regional issue. Other than that, I still think the burlap curtain is a beautiful rustic anser for a window that allows filtered light in, and you have created a gorgeous version of this idea. Oh wow! Your's look fantastic and that is a super tutorial. thanks so much for sourcing it for us. Swoons!! I'm absolutely in love with your decorating style! Could you please let me know the paint colors in the kitchen? 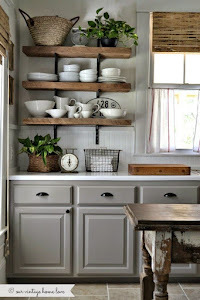 (not the Annie Sloan French Linen on the bottom cabinets, but the top wall behind the cabinets. Thank you so much - Be Blessed!